Starring Jennifer Connelly, Ben Kingsley, Ron Eldard, Shohreh Aghdashloo, Jonathan Ahdout, Frances Fisher, Kim Pickens, Navi Rawat, Carlos Gómez, Kia Jam, Jaleh Modjallal, Samira Damavandi, Matthew Simonian, Namrata S. Gurjal-Cooper, Al Faris, Marc Chaet, Marco Rodriquez and Andre Dubus III. Screenplay by Vadim Perelman and Shawn Lawrence Otto. Distributed by DreamWorks Pictures. 126 minutes. Rated R.
Sometimes tragedy comes to people so suddenly, so inexorably, that its very inevitability shakes all caught in its undertow to their core. 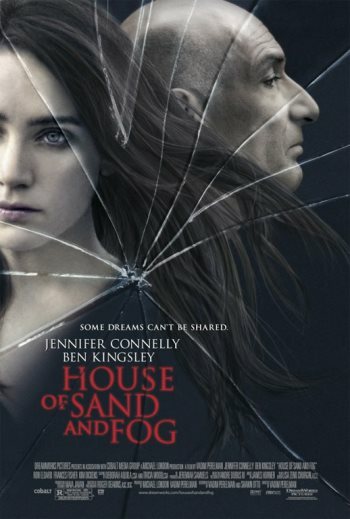 House of Sand and Fog is one of those stories. Two people who would never have met each other but for the quirky twists of fate are joined in a battle royale over a small house not far off the coast of San Francisco. Both parties are in the right and at the same time both parties are wrong. Each one clings desperately to their claim until they are swept into the maelstrom of fate. By the time they realize that there may be room for compromise, it is too late. The winds of fortune have blown and everyone in the path will be destroyed. This hardly sounds like light-weight cinema fare, and it isn’t. House of Sand and Fog is thought-provoking, disturbing and in the end somewhat shattering. But it is also and perceptive, realistic, staggeringly well-acted and strangely beautiful. It feels not so much like watching a film as reading a truly absorbing novel (for good reason, the film is based on a celebrated novel by Andre Dubus III). Jennifer Connelly plays Kathy Nicolo. Kathy is a housekeeper, a recovering alcoholic (and possibly drug addict), and a manic depressive. Her husband left her eight months before and she can’t bring herself to tell anyone. Instead she lies in bed in the dark, crying and feeling sorry for herself. The one thing that she does have is a house — left to her by her late father — a small but cozy cottage that (if you look really far) has a view of the ocean. But Kathy can’t even bring herself to take care of her beloved house. Trash covers every surface and mail lays unopened at the door. This sealed mail throws her life into turmoil when one morning she is awakened by a knock on the door. The county is seizing her house and selling it to pay off $500.00 in back business taxes… taxes that Kathy does not even owe, because she doesn’t own a business. She tries to explain that to the tax man, but he isn’t listening. A sympathetic deputy (Ron Eldard) brought along to oversee the eviction gives her the name of a legal aid lawyer (Frances Fisher) to help her get her home back. The lawyer says that she was completely in the right and the county is responsible for returning her home. But the problem is complicated further when the county auctions off her property at well below its value. The purchaser is Col. Behrani (Ben Kingsley). The Colonel had been a big shot in the Iranian army, but was forced to flee to the United States at the time of the fall of the Shah. For years, the Colonel has been passing himself off as a wealthy émigré and living well above his means. However, the truth is that he is working two menial jobs, nearly killing himself spending days spreading asphalt for the highway department and then heading to a night job as a convenience store clerk. His daughter has just had a lavish wedding, his son (Jonathan Ahdout) is about to go to college and his wife (Shohreh Aghdashloo) misses the affluence they had in the old country. The Colonel is dangerously close to running out of money. In fact, he is so obsessed with every penny that he even counts money spent on Snickers bars in his budget. The Colonel sees the little bungalow as his last chance to save his life in the States. He bought it cheap, his family can live there for a short time, fix it up and make a profit of four times what he spent. Besides, the sea view reminds him and his family of his glory days in Tehran. What we have here are two exiles (her from her house, him from his homeland) desperately trying to hold onto what little place they have left in the world. Kathy lives in a cheap motel for a short time before her money runs out and is then stuck living in the car. Finally, she gets tired of waiting for the legal wheels to move… her case is being held up because the Colonel is insisting that the county pay the market price to get the house back. Kathy tries to talk to him and work it out herself. It does not go as well as she would hope. The deputy starts to fall for Kathy (destroying his marriage and family as well) and tries to intimidate the Colonel. This starts a domino chain of occurrences as the increasingly desperate attempts to gain control of the house spiral out of control. And just when you finally think that maybe it can be worked out to everyone’s best interest, it turns out that everything has gone too far and the locomotive of circumstance is barreling towards everyone. The acting on display here makes this film even more overwhelming, giving the characters a sense of nuance and assuring that the audience will not have a rooting interest against any of the characters. Jennifer Connelly is quietly heartbreaking as Kathy, a woman whose life has been out of control for so long that she would not know to react to stability. Connelly is one of the few major actresses who is regularly able to believably glam down with the character; Kathy is dirty and wears ratty clothes and no make-up and has eternal black circles under her eyes (though Connelly’s great beauty is impossible to totally disguise). I can’t imagine a Julia Roberts or a Sandra Bullock disappearing into a character so selflessly. Ben Kingsley is also wonderful as the exiled Iranian colonel. He is a proud, brave man who feels that he has to work twice as hard to get his family their due in the States, even to the point that he will rationalize hurting the woman whose house it was. Surprisingly, even better than these two acting powerhouses is Iranian actress Shohreh Aghdashloo as Nadi, the Colonel’s wife, a traditional Muslim wife who yearns for her former opulence and yet she mostly suffers quiet sympathy for her husband. She knows he has one more chance to feel like a man to his family and community, and yet she also realizes that his need to control every situation makes him unable to see some of the circumstances he is in clearly. In Kathy she sees a lost soul who she thinks maybe they can save, despite the fact that it may break her family. All three actors deserve Oscar nominations. Copyright ©2003 PopEntertainment.com. All rights reserved. Revised: December 30, 2003. Tags: Al Faris, Andre Dubus III, Ben Kingsley, Carlos Gómez, Frances Fisher, house of sand and fog, Jaleh Modjallal, Jennifer Connelly, Jonathan Ahdout, Kia Jam, Kim Pickens, Marc Chaet, Marco Rodriquez, Matthew Simonian, movie review, Namrata S. Gurjal-Cooper, Navi Rawat, PopEntertainment.com, Ron Eldard, Samira Damavandi, Shawn Lawrence Otto, Shohreh Aghdashloo, Vadim Perelman. Bookmark the permalink.